Spring is finally here - at least for the most part. Which means we can leave the house! It's like were meeting the neighbors all over again. In the middle of the winter, I declared 2015 the "Year of the Outdoors." We were a little lazy last fall and did not clean out all of the flower beds from the leaves. We'll they don't go away after a winter, so 13 yard bags later it doesn't even look like I made a dent. Note to self - Spend the money this fall to have it done. 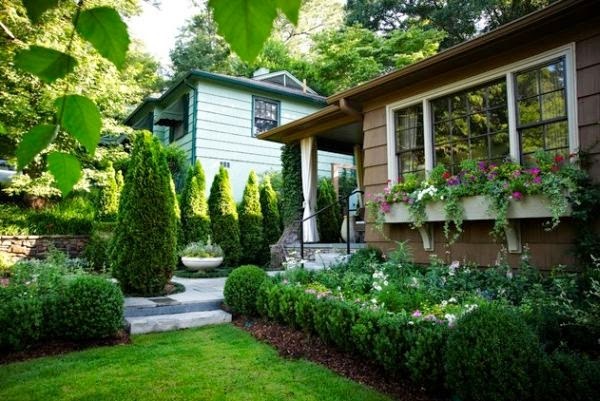 I've never liked front yard landscaping, its very "Green" and there is too much "80's bush" I couldn't tell you what they are really called but you know the green hedges. As you can - kinda- see there are 7, yes 7, in front of the two windows. I decided to trim them down. I wanted to take about a good foot off the top. My hedge trimmer was not going to work, so I ran over to my parents and borrowed my dad's chain saw and started trimming. Well, I just kept taking a little off, then a little more, and then before you knew it, two of the bushes were completely gone. In my defense the bushes were dead except for the top inch or so. All twigs below. So on to plan B for the landscaping. 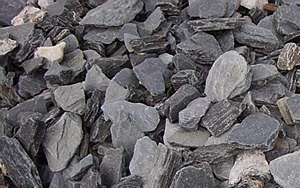 Were having a few tons, yes about 4,000 lbs of slate chips delivered. Bring on the Advil. We tried bags and bags of mulch last year and now you can hardly tell we put mulch down at all. So even thought its more expensive than mulch, in the long run rocks will save time and money. Also, the rocks are heaver than the mulch so when we have to blow out the leaves the rocks won't blow away. And I like them the best out of my options, no way were going to use lava rocks. So, now that I made a big mess of the front yard, I've got to get a plan to put it back together. Plan for the upcoming weekend - Finish the destruction and build two flower boxes. If you remember the DIY Flower Boxes I'm going to make another set. This time they are going to be 12 inches tall, instead of 10 inches so they are more noticeable as they will be much shorter than the first set. Why flower boxes? 2 main reasons. 1. It's a cost effective way to add color and dimension and 2. It mean that the plants below can be smaller and not look out of place. See what I mean, the plants only need to be about 18 inches tall to fit in. Too me there is nothing worse than tiny little plants that look out of place. This way you're not waiting years for the plants to grow into the space. I want to use the window boxes to bring some color into the front yard, I also need to paint our new front door. 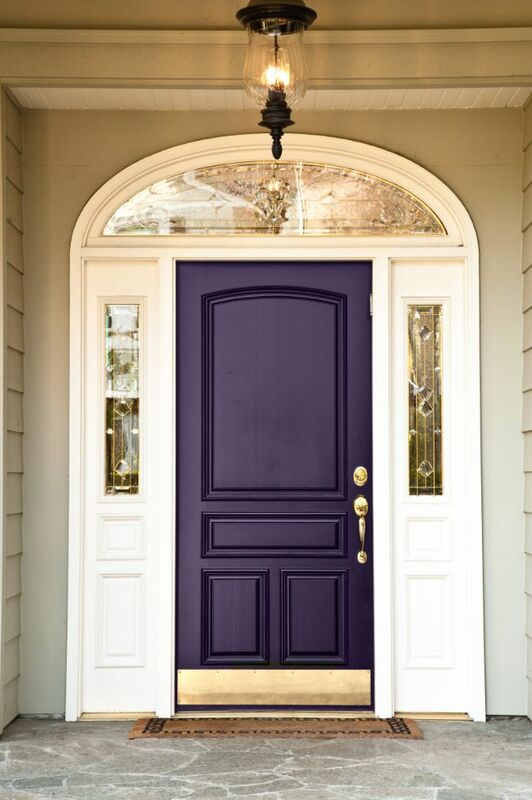 I'm LOVING this eggplant purple, and I'm feeling its the perfect color to accent the red brick and black shutters. Also there are so many great purple annuals and yellow to make a great accent. I'll be so excited to update next weekend will all out progress! Wish us luck!